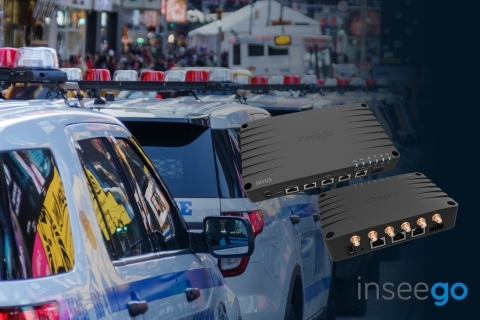 Inseego Corp. (Nasdaq: INSG), a pioneer in 5G and intelligent IoT device-to-cloud solutions, today announced the latest additions to its Skyus industrial IoT (IIoT) portfolio - the ruggedized Skyus™ 300 and Skyus 500 gigabit edge routers, powered by MiFi iQ technology. Both are purpose-built to futureproof and simplify complex deployments while lowering the total cost of connecting critical remote and mobile assets for industrial, public safety, transportation and infrastructure applications. Skyus 300 and Skyus 500 are the only full-featured IIoT routers that deliver secure and reliable LTE (News - Alert) Advanced Pro (LTE-A Pro) peak speeds of up to 1.2 Gbps in a rugged design that conforms with IP64 and MIL-STD 810G military-grade specifications. Inseego's latest additions to the Skyus product family give customers the flexibility to choose the solution best suited for their needs: The full featured Skyus 500 for high performance use cases, such as in-vehicle connectivity; and the configurable Skyus 300-one of the industry's most compact routers for applications with tight space constraints, such as outdoor kiosks or remote infrastructure enclosures. "Today's industrial enterprise applications require more speed and bandwidth than ever before," said Ashish Sharma (News - Alert), EVP of IoT & Mobile Solutions at Inseego. "Our new Skyus 300 and 500 edge routers meet that challenge with the latest Cat 18 LTE technology and allow our customers to operate securely and reliably in challenging industrial environments-with a return on investment unmatched by competing solutions. We continue to evolve our Skyus portfolio to meet our customers' needs with the latest 4G LTE-A Pro technologies. In addition to delivering proven gigabit LTE speeds, these solutions support the CBRS and LAA bands, giving our customers access to significant spectrum and bandwidth when available and activated within service provider networks." "Reliable and durable connectivity is essential for precision agriculture and can be challenging in some rural areas," said Reese Mozer, CEO at American Robotics, the leading developer of fully-autonomous drone-based solutions specialized for rugged, real-world environments. "The flexibility and ruggedness of the new Inseego Skyus solutions solve this challenge, helping enable American Robotics to deliver the real-time actionable insights that our customers need in order to both reduce costs and improve crop health and yield." Media Only: For more information on Inseego's solutions, and/or to schedule an interview with Inseego executives, please email inseego@goDRIVEN360.com.